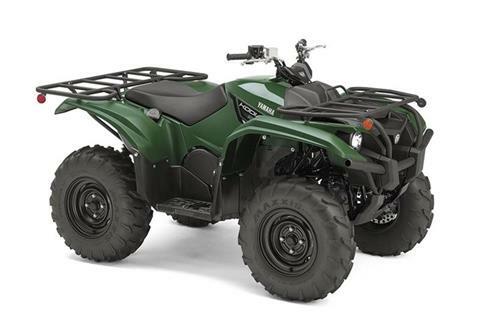 The Kodiak 700 offers up Proven Off-Road capability and comfort during day-long trips regardless if they are filled with chores or trail rides. ENGINE BUILT TO EXPLORE: Packing practical, fun and usable power, the Kodiak 700’s motor balances big bore power with a strong midrange. The 2019 Kodiak 700 features a new 700-class engine with optimized torque, power delivery and engine character that is fun and exciting on trails while still being smooth and quiet when exploring trails or on the job site. STAINLESS STEEL EXHAUST: To maintain clean-running performance for years, the Kodiak 700 uses a stainless steel exhaust system and features a screen-type spark arrestor for great power with minimum noise output. HIGH-CAPACITY RADIATOR: Slow-speed technical riding can place a lot of thermal demands on a liquid-cooled motor, so the Kodiak 700 features a high-capacity radiator with fan assist that delivers plenty of air flow for maximum cooling efficiency—and it’s positioned high in the frame for optimal protection. HIGH-PERFORMANCE TIRES: Maximizing available traction, the Kodiak 700 features 25-inch Maxxis® tires that provide precise steering feel and feedback. STRONG, DURABLE BRAKES: Strong and reliable braking comes standard on every Kodiak 700 thanks to hydraulic front disc brakes matched with a sealed wet rear brake system. GENEROUS GROUND CLEARANCE: To handle nearly any terrain with ease, the Kodiak 700 offers an impressive 11.3 inches of maximum ground clearance and full-length composite skid plates, for maximum underbelly protection. COMPACT ERGONOMICS: A plush seat improves rider comfort for extended days exploring every trail, with plenty of room for the rider to move during aggressive riding. And despite the full-size performance, the Kodiak 700 features a more compact body design similar to a mid-sized ATV, to ease overall feel and handling. INSTRUMENT PACKAGE: For 2019, the Kodiak 700 receives a new instrument cluster with larger all-LCD readouts for visibility. READY FOR ACCESSORIES: The Kodiak 700 was engineered in concert with a range of accessories for perfect fit and function, for nearly every type of ride you can find. With a standard 12V power point, you can keep devices charged, too. WORK-READY TOW CAPACITY: Center-mounted, heavy-duty two-inch receiver comes standard on Kodiak 700 and can tow more than 1,300 lb. 700-CLASS ENGINE: For 2019, Yamaha’s engineers wanted to boost the midrange performance of the big bore Kodiak 700 even further, to put power right where you use it most. At the same time, the new motor features redesigned engine mounts, so despite the increase in performance, it runs even smoother than before. BIG BORE ENGINE BUILT TO TACKLE THE REAL WORLD: Rebuilt for 2019, the Kodiak® 700 combines big bore power without losing an ounce of comfort, thanks to its new 700-class engine with improved midrange power, and gearing designed for low rpm cruising and smooth-running motor mounts. TRAIL-READY CHASSIS: With plenty of ground clearance and adjustable suspension, the Kodiak 700 tackles rough terrain with ease. 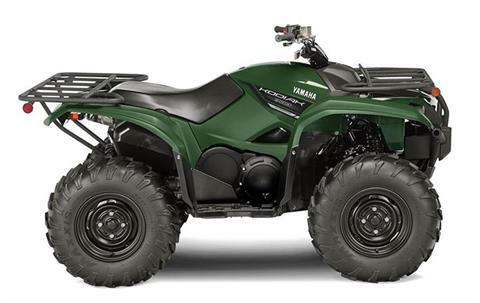 Wide-arc A-arms and full-body skid plates ensure the Kodiak 700 is able to handle anything the farm or trail can throw at it.